Spring has sprung which means shoppers all over will be shopping to update their Spring Wardrobe. 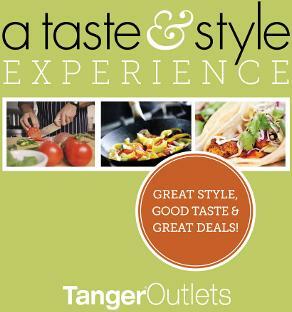 If you happen to live near a Tanger Outlet make sure to stop by and experience Tanger’s Taste & Style Experience! I will be visiting the Tanger Outlet in Gonzalez, Louisiana for a style weekend. 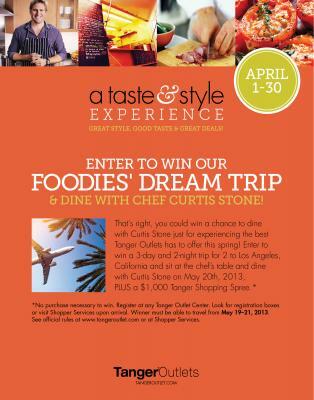 If your in the area, stop by and come experience the Tanger Taste & Style Experience for yourself. The Grand Opening Event – Tanger Taste & Style Experience will occur 04/06/2013 to 04/07/2013 in various cities near you. It’s a fabulous weekend of great style, good taste and great deals that gives new meaning to the term FASHION PLATE! We’re going to treat all of your senses to a celebration of the season’s best new FASHION, FOOD & FUN! Meet Celebrity Chef Curtis Stone on Saturday April 6, 1:00-3:00 PM! The Top Chef Masters wonder from Down Under will be here to tempt your taste buds. And who better to dish out what’s hot this spring? Enjoy his live Cooking Demonstration and then have a chance to meet Curtis, get his autograph and maybe even pick up one of his books! Gourmet Food Trucks all weekend! Including Taco de Paco, Dolce de Vita, CURBSIDE, and MORE! Live music featuring The Stooges Brass Band at 4pm on Saturday and Chee Weez at 3pm on Sunday! A Taste & Style Experience Gift. Great Style, Good Taste & Great Deals! 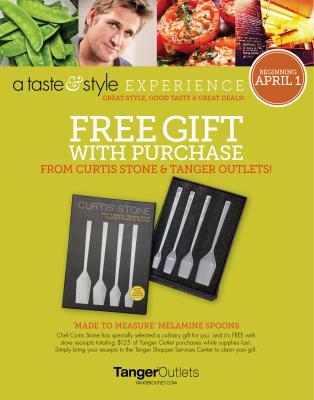 Free Gift with Purchase from Curtis Stone & Tanger Outlets! Beginning April 1st ‘Made to Measure’ Melamine Spoons. Chef Curtis Stone has specially selected a culinary gift for you, and it’s FREE with store receipts totaling $125 of Tanger Outlet purchases. While supplies last. Simply bring your receipts to the Tanger Shopper Services Center to claim your gift. Are you looking forward to updating your spring wardrobe? Thanks for this info. We have local Tangers outlets. Thanks for sharing. Sounds like something my family would enjoy. Oh this sounds great. Too bad I no longer live near a Tanger Outlet. How fun, I think this would be so neat!!! Wish we had a Tanger Outlet! I want to go to a Tanger outlet! I have never heard of this place and we certainly dont have any around here, thanks for the info! We have a Tanger Outlet over on the coast but I have never shopped it. This looks like it would be very fun. We used to have a Tanger Outlet where we used to live and I miss it so much! Sure wish we had one near us – great post! what a great place! we will have to stop by there next time!